NOTICE: Disconnect the battery negative lead. Make a note of the radio keycode. Make a note of the preset radio stations. 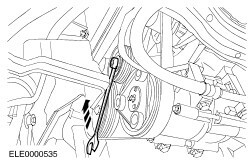 Remove the pulley from the power steering pump. For back-stop use Allen key. TDC mark on cylinder block. TDC mark on the crankshaft timing pulley. Turn the crankshaft to the TDC mark. 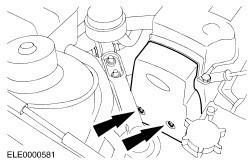 Detach the starter motor and tie it up to the radiator support. Immobilise the flywheel using the special tool. 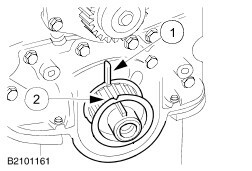 Detach the crankshaft timing pulley. 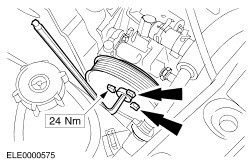 Press the timing belt tensioner all the way to the left. Check the TDC timing marks on the camshaft timing pulley. TDC mark on cylinder head. 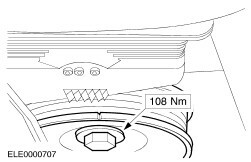 TDC mark on camshaft timing belt pulley. Check the TDC timing mark on the crankshaft. 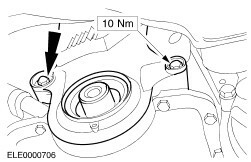 TDC mark on crankshaft timing belt pulley. 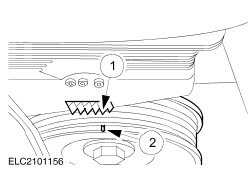 Install the timing belt tensioner and the timing belt. 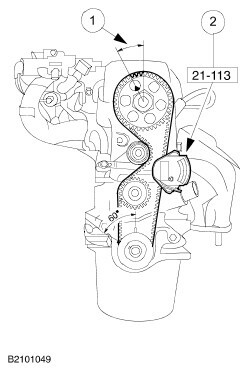 Fit the timing belt anti-clockwise, starting at the crankshaft. 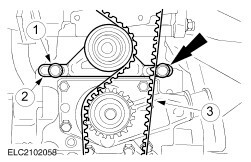 Adjust the timing belt tension as described in step 15. Fit the timing belt pulley lower cover. Install the crankshaft drivebelt pulley. 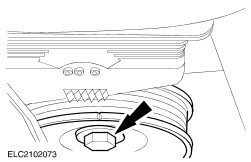 NOTICE: Check the belt tension again after 500 km. 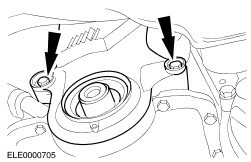 Turn the crankshaft at least two turns in the clockwise direction to TDC position for cylinder no. 1. 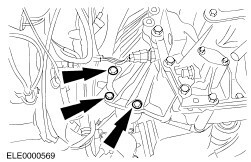 Turn the crankshaft back anti-clockwise through approx. 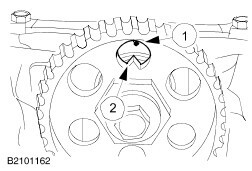 60°(three tooth divisions on the camshaft timing belt pulley). Fit the special tool and read off the timing belt tension. 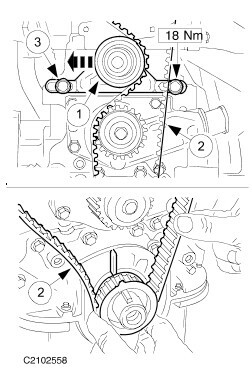 If the timing belt tension is not the required value (new timing belt 10 to 11 scale divisions, used timing belt 4 to 6 scale divisions), turn the crankshaft clockwise to TDC for cylinder no. 1. 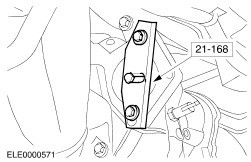 Release the timing belt tensioner and adjust the tension as required. 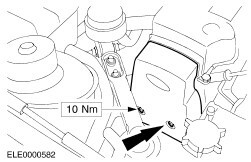 Turn the crankshaft a further 90°in the clockwise direction. 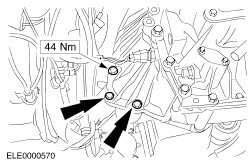 Turn the crankshaft back anti-clockwise to 60°before the TDC position (measuring position). 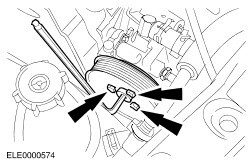 Repeat the process until the timing belt tension is correct. Fit the timing belt upper cover. Fit the pulley at power steering pump. Fit the drive belt in place and tension it. Check that the wiring and hoses are correctly routed and secure them with cable ties if necessary. Reprogramme the preset radio stations. Carry out a road test to allow the PCM (EEC IV) to re-learn values. Check the fluid levels and rectify as necessary.